Almost everyone seems to have a smart phone these days. 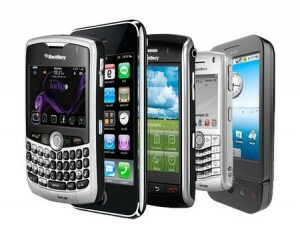 The iPhone really bought the market to the consumer and smart phones are not just the domain of the elite businessman. With advanced social networking functionality and internet browsing speeds that are on par with high speed cabled connections – they have quickly cornered the cell phone market. Following is a list of some of the smart phones that have impressed us recently. Ok, ok, I just want to get this one out of the way. If it wasn’t for the antenna problems that plagued the phone at launch it would’ve been a contender for one of the best phones of the year. However, the phone itself is great. The iPhone OS is incredibly intuitive and the range of apps available are second to none. Also, despite the antenna problems it is probably the most advanced iPhone released to date. Incredible phone by an incredible company – people are quick to assume Samsung as less of an innovator and more of a copier. This is just not the case. Samsung have a massive research and development budget and this phone delivers. It has a 1 GHz processor and is incredibly powerful. It also boasts the ability to capture HD video. It has a huge 4 inch screen and an excellent display resolution. Probably the best Blackberry released so far. The interface seems to have improved dramatically from older Blackberry models. It is also an incredibly smart phone (pun intended). The keyboard is nice to use as well. I am one of those people who aren’t a big fan of onscreen keyboards and this phone is great in this regard. If you have large fingers you might not like it so much – that said however, I found the keyboard surprisingly ergonomic and easy to use. Another Samsung phone – maybe I am a Samsung fan boy after all. This phone is all touch screen activated and has the same size screen as the captivate but has a few extra little features built straight into the phone such as a Kindle app (for e-books), Sims 3 (game), Avatar (yes, the full movie) and mobile TV. It builds upon the Android OS with the Samsung TouchWiz interface. All in all; the phone is a nice package. The Palm Pre Plus is one of the best phones on the market for browsing the web. It also supports real multi-tasking and is a powerhouse of a phone. It utilises Palm’s in house OS called webOS. It has a very sharp display and a really nice design. It feels pretty solid to use and doesn’t suffer much jerkiness like the earlier versions of a lot of Palm’s phones. It is a nice phone to use for work, play or experimentation. These phones are not the be all and end all in regards to smart phone technology; if I had the time I could probably expand the list to over twenty smart phones which are worth considering.